One of the most cherished of Portugal's historical buildings, the spectacular Mosteiro dos Jerónimos (Jerónimos Monastery) is located in the riverside suburb of Belém, west of Lisbon city center, and is a UNESCO World Heritage Site. Commissioned by King Manuel I in 1501, the monastery is an exuberant celebration of Manueline architecture - a fluid and decorative style of stonework that incorporates maritime motifs such as twisted rope and the armillary sphere. Jerónimos's design also blends late Gothic and Renaissance elements with regal Christian, and naturalist symbols that simply dazzle the eye. The monastery lies on the site of a former chapel built by Prince Henry the Navigator (and dedicated to Santa Maria de Belém) where Vasco da Gama is thought to have prayed in 1497 before his epic voyage to India. Construction took nearly a century to complete and was overseen by several master builders, the most notable of whom was Diogo de Boitaca, replaced by João de Castilho in 1517. Diogo de Torralva and Jerónimo de Ruão were also instrumental in shaping the monastery's sumptuous appearance. Monks of the Order of St. Jerome (Hieronymites) occupied the monastery and provided spiritual guidance to seafarers and navigators before they followed da Gama to embark on even longer and equally treacherous voyages to chart new lands. Thus the monastery became a monument to the wealth of Portugal's extraordinary Age of Discovery, and both Vasco da Gama and King Manuel I, together with other illustrious figures, rest within its hallowed, limestone walls. The monastery's south portal is a stunning example of Manueline architecture at its most exuberant. The richly decorated 32-meter door, designed by Spaniard João de Castilho and built between 1516 and 1518, is the visual center of the façade facing the River Tagus. Carved like filigree, the ornate stonework is brought to life by an elaborate collection of 40-odd statues set into the pillars that flank the door, figurines that include Henry the Navigator, St. Jerome and Our Lady of The Three Kings. The twelve apostles can also be identified within this extraordinary sculptural grouping, as well as a pair of miniature lions' heads positioned at the foot of the door. Crowning the whole composition is a statue of the Archangel Michael. For all its sumptuous embellishment, this is still only a side door - the main entrance to the monastery is the less stylized west portal, designed by the French sculptor Nicolau Chanterène in 1517. Visitors should note that the south portal is currently under repair and shrouded with scaffolding until at least the end of 2017. An overwhelming sense of tranquility prevails at the double-tier cloisters. This is one of Lisbon's greatest sightseeing treats, and one of the most celebrated examples of Manueline architecture in Portugal. Diogo de Boitaca (1460-1516) initiated the construction of the cloisters in the early 16th century, but it is João de Castilho who was responsible for most of the graceful stonework that decorates the arches and balustrades, a confection of delicate tracery and richly carved religious and nautical symbols that appear almost weightless in their harmony and ornamentation. A stroll through the lower cloister takes you past a fountain in the shape of a lion, the heraldic animal of St. Jerome. In the north wing is the tomb of poet Fernando Pessoa (1888-1935). The adjacent refectory is noted for its late 18th-century azulejos (tiles). Continue your amble along the shady arcades to reach the chapterhouse, where the tomb of the revered Portuguese historian and first mayor of Belém, Alexandre Herculano (1810-77), is held surrounded by a series of illustrated panels highlighting his life and achievements. The upper cloister reveals the 12 niches where navigators paused for confession before their voyages of exploration. The fabulous view from the second tier takes in the entire amber-hued limestone quadrangle. Inextricably linked to Portugal's golden Age of Discovery, Vasco da Gama and Luís de Camões are two of the country's most important and influential historical figureheads. Vasco da Gama (1460-1524) was the trailblazing navigator who opened up a sea route to India in 1498 and in whose honor King Manuel I had the Mosteiro dos Jerónimos built. Luís de Camões, born the year da Gama died and regarded as Portugal's finest poet, subsequently chronicled the Discoveries era in his epic Os Lusíadas. Although their highly ornate tombs bear all the symbolism of Manueline architecture - carved ropes, spheres, and other seafaring motifs - both in fact date from 1898 and used to lie in the south chapel before being moved closer to the main entrance. They are among the most admired and photographed of the church's historic artifacts. A truly remarkable perspective of the church interior is afforded from the upper choir. From this lofty viewpoint the nave and its vaulting can really be appreciated, where the space and harmony of the church is brought to the fore. The upper choir, designed by Diogo de Torralva in 1550, is where the Hieronymite monks would spend several hours a day praying and chanting. The stalls, hewn from oak and chestnut by master craftsmen Diogo de Carça and Filipe de Vries and influenced by Flemish and Italian decorative techniques, were the first Renaissance wood carvings created in Portugal. Embellishing the walls is a series of 18th-century paintings depicting the apostles. Adjacent to the stalls is a small salon where a looped video narrated in English explains the history behind the church and monastery. To gaze upon the imposing chancel of the Church of Santa Maria de Belém is to muse over the burial vaults of King Manuel I; his wife Queen Maria; their son, King Joao III; and his wife, Queen Catarina, who commissioned the chapel in 1572. 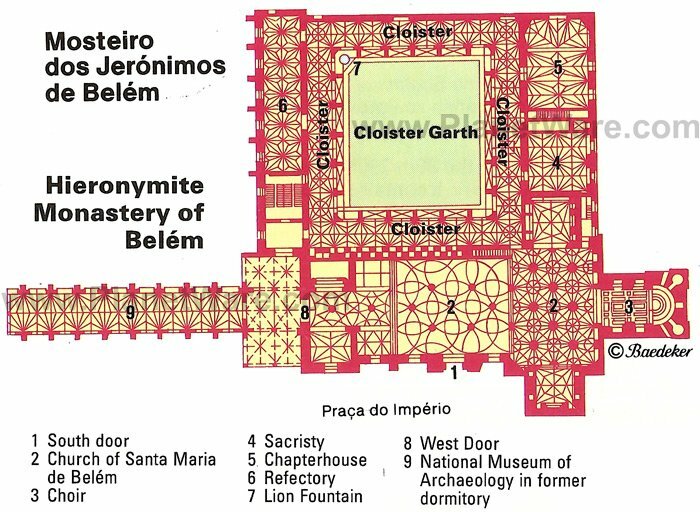 The "Manueline" architectural style is named after Manuel I, but the chapel is the handiwork of Jerónimo de Ruão, who also built the transept chapels, and de Ruão's empathy with Mannerism is clearly evident: look closely and you'll notice each of the tombs are borne by marble elephants. The Mannerist retable, designed by Lourenço de Salzedo in 1574, features a series of beautiful paintings depicting the "Passion of Christ" and the "Adoration of the Magi," which surround a silver tabernacle crafted by Portuguese silversmith João de Sousa in 1678. Set either side of the nave, the church's two transept chapels - the north chapel and south chapel - were built around 1587 and radiate regal symbolism. Each is designed in an arrangement typical of the Mannerist style introduced by architect Jerónimo de Ruão (1530-1601) where the niches fashioned to accommodate tombs alternate with those created as altars. The tombs in the north chapel were planned for the burial of King Manuel I's children, among them King Henrique, while those in the south chapel were for the offspring of King João III and his grandson King Sebastião. Poignantly, Sebastião's own tomb remains empty. The young king never returned from North Africa, falling in the Battle of Alcácer-Quibir in 1578 along with 8,000 of his men. The sacristy is rarely included on monastery guided tour group itineraries, so for the most part is blissfully bereft of the sightseeing throng. Instead, visitors pay a modest surcharge to enter this beautifully serene room in which the vaulted ceiling radiates from a central Renaissance column. Designed by João de Castilho and built between 1517 and 1520, the sacristy is furnished in black wood and includes a superbly crafted late 16th-century chest of drawers attributed to Jerónimo de Ruão that lines the lower half of three of the room's four walls. Surmounting the chest is a gallery of 14 oils depicting remarkably vivid scenes from the life of St. Jerome painted during the early 1600s by Simão Rodrigues (see if you can spot the devil tempting the saint with a book riddled with profanities). After entering the church, the gloriously gilded Chapel of Senhor dos Passos - the ancient Chapel of St. Anthony - is immediately left of the main entrance. Unfortunately, you have to peer through an iron grill to appreciate the exquisite 17th-century paneled wood carvings, which are outstanding in their detail and craftsmanship and date from when the Senhor dos Passos brotherhood was founded. Walking Tour: Mosteiro dos Jerónimos is among Portugal's most popular cultural draws and often overwhelmed by visitors, even in winter. A convenient way to beat the crowds is to join an organized Belém Walking Tour in Lisbon Including Skip-the-Line to Monastery of St Jerome and Belém Tower. This 90-minute tour saves you standing in long lines at these popular tourist attractions and it also includes a visit to the Monument to the Discoveries. Morning visits on clear days are rewarded with bright sunlight illuminating the stunning colors of the church's stained glass windows. Access is restricted on Saturday morning, during Sunday morning Mass, and during other liturgical and religious services. Visit the permanent "A Place in Time" exhibition staged in the library that chronicles the monastery's 500 years of existence and its context within Portuguese and world history. Belém is blessed with a collection of fabulous visitor attractions, but elsewhere in the city there are plenty of equally captivating places to see and things to do. Start ticking off your wish list by checking our Top-Rated Tourist Attractions in Lisbon page. There are also some great day trip options, which include excursions to UNESCO-protected Sintra and sites like the historic Palácio Nacional de Sintra. Back in Lisbon, the city's old quarter is another evocative district that should be wandered through at leisure.